Chieflands Newest and Biggest Storage Facility Currently accepting applications for covered and uncovered storage; Spaces are filling up fast. Our beautiful modern storage facility boasts both non-climate and climate controlled storage spaces, as well as convenient drive up self storage units that are perfect for students and residential/business tenants alike. Our personal & business storage units range in size from 25 to 500 square feet. The facility is fully fenced with access to the facility granted through a security-controlled gate. 24-hour camera monitoring is wide spread throughout the facility providing the facility with an extra level of security. When you don't have room to store your RV or Motorhome in your driveway, Big Chief can help! 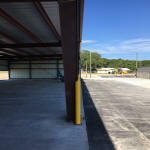 Our entirely paved facility offers storage options specially designed for your vehicle. You have made a large investment in your boat or motorhome and you need a high level of care. Big Chief Boat and RV Storage is a premium vehicle storage facility in Chiefland providing Covered Storage protection and economical Open Storage for all types of vehicles. Preserve your boat's longevity by storing it out of the water, directly on it's trailer. Our facility's easy access allows you to drive in, hitch up, and start enjoying your boat faster. Currently accepting applications for covered and uncovered storage; Spaces are filling up fast. Copyright © 2017 Big Chief Mini Storage. All Rights Reserved.